The slim line of camcorders that use BN-V507 batteries only has two choices. BN-V507 and BN-V514. V507 lasts about 2 hours, while V514 lasts 3-6 hours. V507 is very thin and slim, while V514 is very bulky. 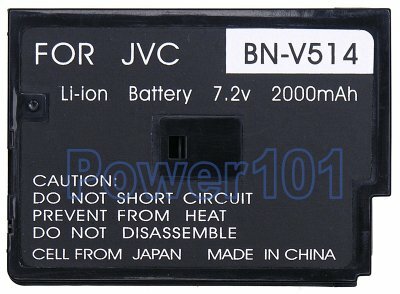 Sometimes these batteries are referred to as BN-V507U and BN-V514U. The "U" at the end makes no difference and these are just different names for the same batteries. For an average user, V507 has too short of a runtime, and V514 is too bulky. Most users opt for two V507's. However, the best solution is the slim V514 which is not manufactured by most manufacturers, and is quite rare. These slim V514 have the best of both worlds. They are almost the same capacity as full-size V514, and yet is just twice thicker than V507. 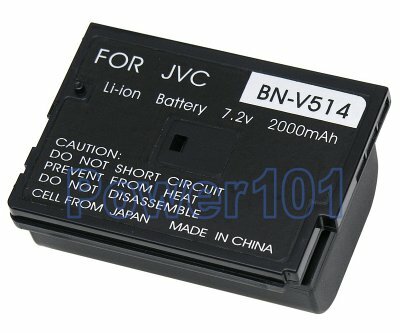 This battery is compatible with JVC GR-DVM50U GR-DVM55U GR-DVM70U GR-DVM75U GR-DVM80U GR-DVM90U GR-DVX10 GR-DVX4 GR-DVX40 GR-DVX44 GR-DVX48 GR-DVX49 GR-DVX7 GR-DVX70 GR-DVX77 GR-DVX78 GR-DVX8 GR-DVX80 GR-DVX88 GR-DVX9 and GR-DVX90 camcorders. Please check our camcorder compatibility list if your camcorder is not listed here. These batteries can be charged by any standard chargers for V507 and V514, including the chargers that come with camcorders. Or directly on the camcorder.